St. Andrew's Model UN team organized and hosted a Model UN conference on campus on November 4. Five schools and 100 students attended the conference, in addition to the 35 Saints who participated as delegates and the 17 Saints who staffed the conference, which was held in the Arts Center and the new classrooms in the basement of the Old Gym. "SASMUN was a resounding success," said Model UN faculty advisor Will Rehrig. "The conference was years in the making, with student leaders Tad Scheibe '19, Noor El-Baradie '19, Ann Yancey Bassett '19, and Miles Abney '20 dedicating countless hours crafting a conference experience that would challenge delegates of all experience levels. Many of the schools in attendance commented on how impressed they were with the conference especially given it was the first year." 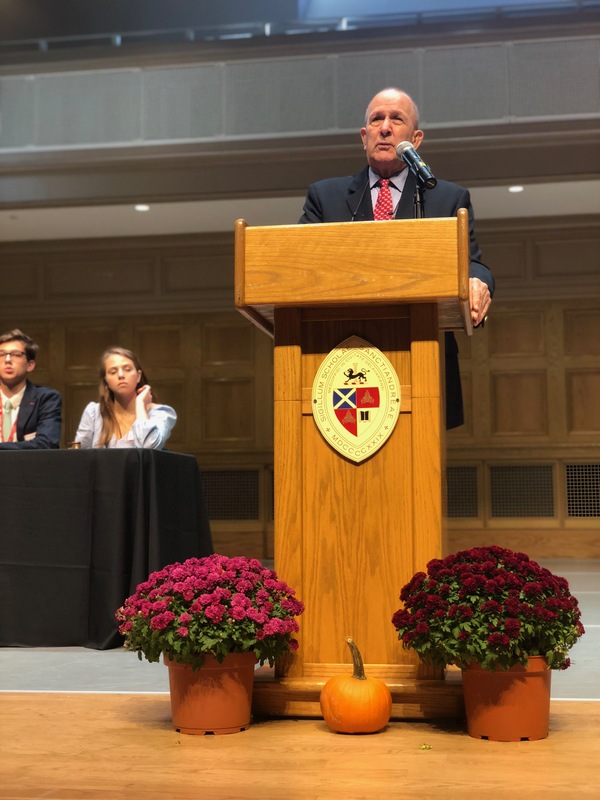 The conference's keynote speaker was Sam Wyman '57 (seen here, who shared his extensive experience in foreign affairs—he spent more than three decades with the CIA and earned the Department of State's Meritorious Honor Award—and highlighted the current challenges facing the UN. During the conference, students engaged in stimulating debates that focused on finding collaborative solutions to major global challenges. Discussion topics included Landmine Action, Social Media & Internet Use, The Paris Peace Conference of 1919, Tibet & Chinese Relations in 1960, and The North Korea Crisis. All of the simulations were created and run by St. Andrew's students who were required to pick their committee topics, become an expert on their topic, write a background guide explaining the topics to delegates, and then chair and lead the discussion of the topics during the conference. Students attending the conference were required to research the designated topic from the perspective of their assigned country and prepare to collaborate with other countries to find unique solutions their particular area of focus. "One of the great moments of the day is when Religious Studies teacher Jason Kunen portrayed the Dali Llama, and met with students during a tense discussion between Tibetan and Chinese delegates looking to broker a peace accord," Rehrig recalled. "He came in last minute—Xander Atalay '19 called him during the conference and asked him to walk over to the Arts Center to participate—and really helped provide an authentic experience for delegates." "The conference was designed to allow St. Andrew's students to experience Model UN in very accessible way, right on campus," noted Rehrig. "It also served as a fundraiser for yearly conference expenses for the SAS Model UN club." This was the first Model UN conference for many St. Andrew's students, and many first-time attendees won awards, including: Outstanding Delegates (Griffin Pitt '21 and Piper Jackman '21, representing Afghanistan in SPECPOL), Outstanding Delegates Honorable Mention (Nina Zimmerman '21 and Madeline Birknes '21, representing Greenland in SPECPOL), and Best Delegates (Hans Shen '21 and Arvin Vanikar '21 representing Israel in SOHCUM). "Every student in attendance walked away more knowledgeable in foreign affairs and the skills required in diplomacy," Rehrig said. "The conference helped to show students the value and importance of collaboration and compromise, whether you are dealing with some of the largest threats in the world, or a disagreement with your roommate." Work on SASMUN II has already begun; students intend for the conference to be an annual event held at St. Andrew's each fall.